I had a BBQ this weekend! Of course, I had to channel Patricia Routledge's character, Hyacinth Bucket...."It's pronounced BOUQUET!!!!". I simply love this show! In one favorite episode, she has an Outdoors Indoors Luxury Bar-B-Q and Finger Buffet. She had her husband, Richard, "[He] was alway Richard Bucket before [he] met Hyacinth. . .", take her to the Garden King (a local greenhouse, who's owner was to be a guest at her Candlelight Supper, as she called her dinner parties, that to everyones' chagrin they are invited) to buy lots of plants ("to make him feel at home"). There are several great scenes in the episode where they are in a car full of plants--Richard can barely see to drive ("I wish there was less outdoors indoors in here right now! [says Richard, Hyacinth snips back: "there's no need to be argumentive, dear"). Needless to say everything goes awry, including her very much lower class, but so much more lovable family, showing up! If you love Hyacinth as much as I do, you can get your very own copy on Amazon here: Keeping Up Appearances: The Full Bouquet . Either way onto more photos!!! Oops...crooked tablecloth! How did I let that slip past me? Probably because guests were due to arrive at 6:30pm and I hadn't begun to set the tables and it was just after 6pm! Oh no! See the great vintage shutters on the shed? They didn't happen until about 5 min. before everything was supposed to start! Ha! Vintage table linens, antique silver plated flatware, and white ironstone plates were the way to go. The plates were several different patterns, but all the same white color. All of the silver was mis-matched. I used mercury glass and vintage silver creamers, sugars, and trophies to disguise citronella candles and tea lights. Though I used napkin rings, I used paper shop towels for napkins. Here are my new chairs in use! You may remember them from a post a few weeks back. I did my usual color wash technique on them. Tutorial coming soon, along with my vent hood tutorial. I'm sorry to be dragging that one out for so long!!! I used that same paint treatment on my other chairs, too. It gives them a mottled, well-loved look. I put vintage mirror under all of the centerpieces for extra sparkle. I also layered table linens for a more casual look. Here, you can see, I didn't have quite enough of the white ironstone (or knives for that matter...) to go around, so I used these nifty tulip plates (also from grandma). My grandmother really likes square plates, and has several sets. She recently bought a set of really modern looking stark white square plates at Target and loves them. Oops...missing chair--actually it is next to the grill, just out of shot! My conscripted burger flipper needed a spot to sit! I placed these two smaller tables together so whomever sat there didn't feel left out, since the rest of the tables sat 4 - 6! I finally was able to put my steeple to good use. Here I used it to anchor an outdoor 'room'. Plus, I made sure it is no longer crooked! Yay! What garden is complete without a chandelier? A vintage bed makes a great place to curl up. I love the drippy goodness from the candles! This tea cart was a birthday present last year. It actually came in a flat pack box from a Big Box hardware store! It was black, but I painted it white. Similar chandelier available on Amazon. I used as many vintage serving pieces as possible. This galvanized tin basket made a great place for buns. Always remember to throughly clean and line vintage containers! I used these (new, from Tuesday Morning) flour sack tea towels. A large thrift store clam shell dishes up salsa! Tomatoes look so much nicer on an antique ironstone platter. I think this one is Johnson Bros.
My friend, Brenda, made theses great HOMEMADE cupcakes! She is so creative! Of course there was angel food cake with berries! This is a must for any summer cookout! I had some leftovers of that for breakfast this morning! I snapped a few photos once the sun went down. I'll leave you with this one last photo and some tips to achieve a really great vintage vibe for your next cookout! 2. Put said finds to good use! 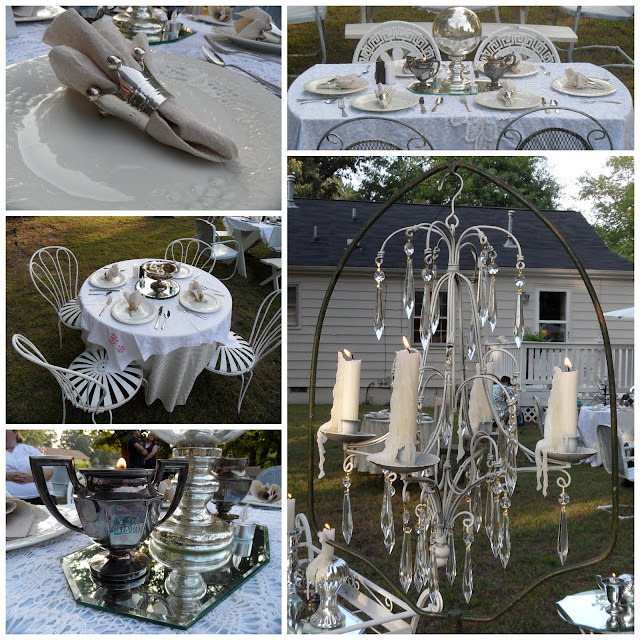 Pull out the china, linens, and silverware for your outdoor event! Don't be afraid to use it. There's nothing that a little Oxyclean can't handle! 3. Ask for help. All my guests brought a side or dessert. Some threw a hand getting the house cleaned, setting the tables, etc. 4. Borrow! I didn't have quite enough plates to go around. So I went to grandma's house! She gave me 12+ additional place settings of white ironstone! 5. Music--to further enhance the elegant mood, I picked a playlist of classical music--string quartets, piano concertos--nothing heavy or daunting. Simply light and airy music to fit the occasion. I even threw in a few beautiful instrumental piano covers of some Lady Gaga and Celine Dion hits! 7. If you don't have all white china, it's all right with me! Mix florals or transferware or depression glass or what have you together. A word of advice, if you're using depression glass mixed with an ironstone, always use the depression glass dinner plates on white or light colored tablecloth and put the opaque mis-matched dinner plate on top, as if you do it the other way around the color sometimes gets lost! 8. Use table linens! A picnic is so much nicer when the table is nicely dressed! Even a hot dog seems to taste better! 9. If you have several smaller tables, push them together, so guests do not feel disjointed from the rest of the group. No one likes to sit at the kid's table! 10. Bring usually indoor furniture outdoors, even if just for the party. Having an upholstered piece or two outside really makes everything feel more cozy. Of course if it looks like it might rain, or you're having a pool party, that's a different ballgame!!! I LOVE comments! If you have any questions--I'm all ears! If you haven't already, I'd love for you to become a follower! I try my best to follow back, and must apologize, as I'm a bit behind from where Google Friend Connect was on the fritz the past few days. You can also find me on Facebook! Disclaimer: I am not associated with nor am I affiliated with or compensated by Greenbriar International dba Dollar Tree, Target, Oxyclean or its parent companie(s), or any other companies or products mentioned in this blog post. All opinions are my own and not paid advertisement. Exception: The link(s) to Amazon.com featuring a product described may lead to my own personal profit, if a purchase is made, but nonetheless, this is a personal favorite item and a heartfelt personal recommendation, not outright paid advertisement!